Visitor Host Vicky King spends a lot of time with the big guy. She gives us her unique insights on what people think of our walrus. The walrus is everyone’s favourite celebrity at the Horniman, including mine. Growing up visiting the Horniman means it has a special place in my heart. Since working here and finding out more about the collections my appreciation for the Horniman has increased. What is it about the walrus that makes it so loveable? It’s hardly something cute and familiar like a cat or dog. I’ve asked some of the visitors why they like the walrus to find out. “When I was little I was really scared of the walrus,” a little girl told me and also proudly said how she wasn’t scared anymore and liked him now. Regular families to the Horniman always come to say hello to the walrus, but it’s not only children that are fond of him. “I love that story that the Victorians over stuffed him,” a lady told me. “I guess it’s that all the other animals are real representations of what they are but the walrus is just funny looking because it’s too big. Also walruses look a bit funny with their tusks,” one of our volunteers said while we chatted about the Museum. This seems to be a popular theme adults like. I also love that one of our most popular exhibits is so popular because it's not actually correct. Visitors particularly ask this about the walrus. People know it’s wrong but they can't always put their finger on why. When told the story of it being over stretched (because the people who stuffed it didn’t know what a walrus looked like) always gets a positive reaction. For me one thing that really made me love the walrus was a story Jo Hatton our Keeper of Natural History told us while she gave a tour of the Gallery. The walrus wasn’t always the focal point of the Natural History Gallery. You can see in photos of the museum years ago that we had much more larger animals on display including a polar bear. However, the larger animals were sold to a dealers in Deptford in 1948 who, in turn, sold them on to a photography studio near the Kursaal in Southend-on-Sea as amusements for people to have their photos taken with. The walrus was spared this fate probably because he was so heavy and funny looking. They most likely ran out of room in their truck and decided to leave the walrus behind. I think this story is so sweet, like The Ugly Duckling, but in the walrus' story he didn’t turn into a beautiful swan, people just learned to love him for being funny looking. Why do you love the walrus? Tell us online using #Horniman. Ever wondered how to lift a one-ton Walrus? The Horniman Walrus inspires Forest Hill’s sixth annual Scarf Festival. A haberdashery and craft emporium local to the Horniman, Stag & Bow, is holding their sixth annual Scarf Festival this week. Every year they invite customers to join in their celebration of making based on a different theme. The subject of this year’s theme is the Horniman Walrus. The designs people have sent in are displayed in the shop window all week until Saturday 10 December. The festival will culminate in a joint sixth birthday celebration for Stag & Bow, and a prize-giving event for the most inspiring creations. This year’s guest hosts will include our very own Kirsten Walker, Director of Collections Care and Estates and Timothy Spall, patron of the Horniman and local national treasure. Why not pop down and join in the fun at Stag & Bow where celebrations will be held throughout the day on Saturday 10 December. Take part in a cultural treasure hunt around London. The Horniman Walrus tile is hiding somewhere in our Museum. Track it down and its clues will help you in the Curiocity treasure hunt. Everyone knows that the Horniman Walrus lives on top of an iceberg in the middle of the Natural History Gallery. But did you know there is a second, very small walrus also located somewhere in the Museum? Hidden somewhere in our Museum is a tile with a drawing of the walrus. This tile is part of a treasure hunt. Six tiles are located in various cultural places around London. You can find clues to the locations of these tiles on p.449 of the book Curiocity: In Pursuit of London. Beware traveller of the Horniman Walrus! Gather up all the clues on these tiles and they will take you to a secret location where you can inscribe your name on to a winner’s list which will be included in future reprints of the book. If you're looking to enter the #wanderingwalrus competition, there's no better place to pick up your own cuddly travelling companion than the Horniman Museum shop. The Walrus toys sold in our shop aren't modelled after just any Walrus. They've been specially created to celebrate the wonderfully unique shape of the Horniman Walrus himself. When our Walrus was brought to England in the 19th Century, Victorian taxidermists had never seen a live Walrus before. They had no idea about the skin folds which should appear around the chest and neck, which resulted in our Walrus getting a little 'overstuffed' and standing rather tall. Our Walrus cuddly toys have been deisgned to have that same upright, wrinkle-free look. They come in two different sizes, so you have a choice between a Walrus mini-me and a mini-mini-me. Grab yours now before they all go wandering! Good morning everyone, and welcome to our live blog about our walrus move. We'll be updating this throughout the day to let you know how the move is going. While the move is happening, our Natural History Gallery will be closed to visitors, so we hope that this blog will take you behind the scenes and give you a sense of what's happening. So far, the Walrus has been cleaned in advance of his visit to Margate. Also the iceberg which surrounds the Walrus has been removed. Moving the Walrus is giving us a chance to learn more about him, including what's inside. The scaffolding is going up around the Natural History Gallery in preparation for the lift. It's...purple? We've now moved on to x-raying the Walrus' head. Currently preparing the crate in which the Walrus will be transported. Click for a picture. The gantry which will hold the walrus as he is lifted is now complete. Walrus wheeled into position before his upward move. Being lowered on to a new platform to take his weight for the big lift. We're very happy, relieved and glad to report that our wonderful walrus has been moved successfully. He's currently being packed up in a crate in advance of his trip to Margate. Here's a short video of him in the air - we'll have a longer video about the whole procedure later in the week. The Walrus has spent the night on his new platform at the front of the gallery. Today he will be carefully packed by the Conservation team and safely crated up ready for his journey to Margate. The first task for today is for our conservation department to check the Walrus's condition, and make sure he's ship-shape for his trip to Margate. We're packing the Walrus to make sure he will be safe when he's in transit. Packing the Walrus is continuing, including a 'blindfold' to protect his eyes. Having placed protective covers around the Walrus, we're now beginning to build the remainder of his crate around him. Just putting the finishing touches to the crate packing to make sure he can't shift about while on the road. The last job for today is to put the last pieces of the crate together, so it is ready to leave the museum tomorrow morning. That's it for the Walrus updates today. Tomorrow, he finally leaves the Natural History Gallery and makes his way to Margate. This morning the Walrus in his crate was maneuvered out of the museum and into the fresh air. This is the first time he has left the Natural History Gallery for well over 100 years. The Horniman Walrus is loaded up and on his way to Margate! Margate, here I come! The biggest thing to hit the town since Mary Portas. A team from the Horniman are accompanying him on his journey. He's arrived safely! And with a big audience, naturally. The Walrus' air travel isn't quite over. He still has to make his way up onto his new plinth. Check out our Instagram account for more pictures of the Walrus being lifted, given his new plinth, settling in and getting checked over by the Conservation team. He's up and making himself at home. The Horniman conservators have done their final checks before leaving him in capable hands @TCMargate. Tune into BBC South East this evening to catch an interview with @HornimanWalrus and guest curator Brian Dillon. See a picture of the interview. Next week the Horniman Walrus will be making his way to Margate to feature in the Hayward Touring exhibition Curiosity: Art & The Pleasures of Knowing at Turner Contemporary. 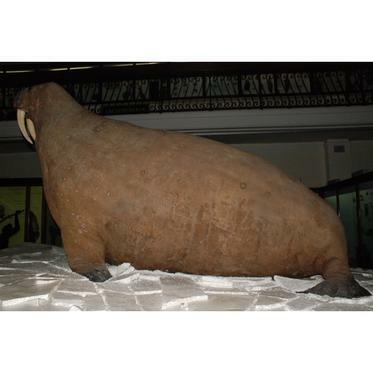 Our famously over-stuffed walrus, weighing in at just under one ton, has been in our Natural History Gallery since 1901. Since then, he hasn’t moved more than 25 feet, so getting him out and on his way to the coast is a huge task for museum staff to organise. Our conservation department has been working with specialist art handlers to ensure the move goes as smoothly as possible. Preparations are under way: the Walrus has already received his annual clean, and the larger pieces of his iceberg are being moved away. The Walrus' iceberg needs to be removed to allow access for the all-important lift. The biggest challenge is the need to lift the Walrus out of the gallery over the other cases. The Natural History Gallery will be closed to the public next week while this is happening, but we've put together some simple sketches to help you picture what will happen. The Walrus will be lifted on Monday 13 and will leave the Museum on Wednesday 15 May. The Natural History Gallery will be closed throughout, so this week is your last chance to wave goodbye and wish him well on his holiday. He'll return to the Museum in September. Be sure to follow the Walrus' journey on Twitter, and keep an eye on our blog, as we'll be live-blogging throughout. You can even catch up with the Walrus' own comments @HornimanWalrus.